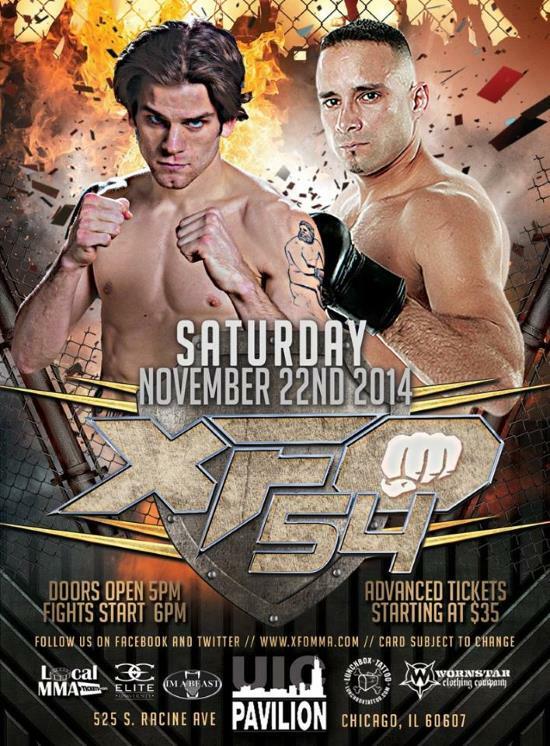 Adam Ward is happy to be in the main event of XFO 54 at the UIC Pavilion on Saturday, where he’ll fight veteran Rey Trujillo. Fighting in front of your hometown fans and headlining a show is great, but Ward is focused on one goal. With four straight wins, Ward looks like a fighter that can’t be stopped. He’s hoping a win over Trujillo, who has fought former UFC fighters Leonard Garcia and Daniel Pineda, will be enough to get him his big shot. “I’m hoping for a call from the UFC with this win, but I will take another fight to keep the streak going,” Ward told Chicago’s MMA. Ward not only takes the fight wherever it goes, he goes wherever the fight is. He most recently fought at HFC 20, beating long-time local fighter Jared McMahan. Prior to that he fought twice in Finland. The last time he fought in Chicago was last September at TFC, where he needed just :42 to choke out Pedro Velasco. That was back in 2008. Ward got to training and took his second fight about ten months later at XFO 27. This time he was the one tapping his opponent, winning by rear naked choke just over a minute into the fight. See Adam “A.D.D.” Ward, Daniel “The Predator” James and many of the best local pro fighters at XFO 54, Saturday night at the UIC Pavilion. For tickets, visit bit.ly/xfo-54.